Today’s customer wants to move effortlessly across your online and offline channels, from initial contact to purchase and beyond. Along the way, they expect you to know their interests and preferences and use this data to provide consistent, timely, relevant, and personalized engagements. Yet, enabling an outstanding customer experience requires you to overcome the fallout of IT decisions made over years, resulting in incremental purchases of siloed, on-premise, channel-specific solutions. The resulting labyrinth of systems, with its islands of channel-specific data, is a barrier to creating a consistent customer experience across all touchpoints. Achieving success in today’s digital competitive marketplace means modernizing legacy data warehouse and retail data analytics solutions. Remedying siloed systems will create a single source of truth to enable the brand experiences that customers want and expect. Easily understand where you are winning or losing market share by tracking direct-to-consumer and other online channels with a managed, cloud-built data warehouse that automatically scales up and down for unlimited workloads without impacting performance. From point-of-sales data, clickstream data, customer loyalty program data, social media, or sentiment analysis, provide a data-driven customer experience by easily loading, transforming, and integrating all your structured and semi-structured data. Category performance, promotional, and marketing analysis, product management, and more are easily brought together into a single customer profile. Modern data sharing data enables collaboration between consumer goods, manufacturers, and retailers. Since we’ve started using Snowflake, we see a more collaboration between groups because they’re all using the same tool. Snowflake makes my job really easy! With Snowflake, retail executives can leverage the cloud to unify their data and access it in real time to get the coveted 360-degree view of their customer, build omni-channel campaigns, and increase sales. Find out more in our eBook. 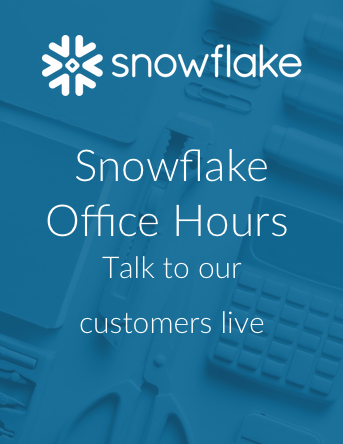 With Snowflake, Office Depot is now significantly decreasing the time between insight to action while creating new efficiencies for customers and shareholders.